Bubbles formed on tiny composite nanostructures could help eliminate cancer cells. The micron-size bubbles can exert lethal pressure on the membranes of cells that collect the composites. Alternatively, smaller harmless bubbles can betray a cell’s location. In both applications, nontargeted cells sustain no damage, giving the method potential for cancer imaging and treatment. Matthew O’Donnell, Lajos Balogh, Jing Yong Ye and colleagues at the University of Michigan in Ann Arbor and at Roswell Park Cancer Institute in Buffalo, N.Y., began their investigation with dendrimer molecules. To the multiple branches emerging from the dendrimers’ central core, they conjugated folic acid and interspersed metallic silver among the branches, where it became trapped. Folic acid binds to cancer and to other rapidly dividing cells, which take up the dendrimer-bound nutrient with their folate receptors. Microbubbles form when organic material breaks down and evaporates in the laser’s focal point; the presence of silver nanoclusters in the dendrimers, however, lowers the energy threshold for their formation by several orders of magnitude. The researchers added the nanocomposite solutions to a suspension of human skin-cancer cells and observed them with a Zeiss confocal microscope. Ultraviolet excitation caused the structures to fluoresce in the blue spectral region, making them highly visible. Through comparison with control samples and fluorescence imaging standards, the researchers found that cancer cells took up significantly more folated composites than healthy ones. Transmission electron microscope imaging with a Philips device and a Hamamatsu digital camera revealed the same trend. To induce bubble formation, the scientists exposed the samples to 800-fs pulses at 1053 nm from an Intralase Nd:glass chirped pulse amplification laser. A signal from a high-frequency ultrasonic sensor was analyzed to detect the formation of bubbles, which reflect sound waves. Nanocomposites taken up by human body cells exhibit blue fluorescence when subjected to UV excitation, as seen in this confocal microscope image. Exposure to IR radiation could allow their use in treatment as well. Courtesy of Lajos Balogh, Roswell Park Cancer Institute. In cancer cells, bubbles began to appear at energies 100 times lower than in cells containing no nanocomposite particles. When small and nonlethal, the bubbles were easily recognizable in ultrasound images. 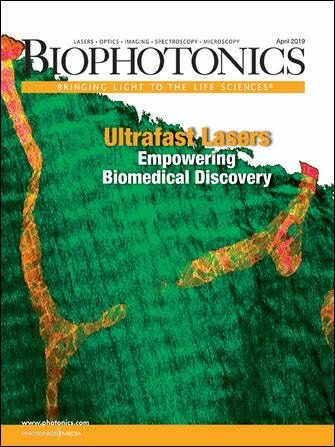 Increasing laser power generated larger bubbles that caused cell lysis. Bubbles disappeared before they could contact adjacent cells, however, and the radiation levels used did not harm cells that collected a few or no composites. The bubbles’ transient nature may offer advantages over other optical cancer treatments. Oxygen radicals generated during photodynamic therapy, for example, can invade and kill healthy cells. Heat generated during nanoparticle-based thermal therapy can spread as well, leaving damage in its wake. Multiple binding sites on the dendrimers enable targeted delivery using a variety of functional groups, while optimization of the procedure could allow ultrasound-guided imaging followed by treatment using higher irradiation energies. And because IR radiation penetrates tissue deeply, the method could extend to both superficial and buried cancer cells. Development of the technique — which the researchers presented May 24 at Nanotech 2007 in Santa Clara, Calif. — will continue. Besides conducting in vivo tests for skin-cancer treatment, the scientists plan to test various surface moieties that target other types of cancer. According to Balogh, the method could hold promise for elimination of malignant cells in the context of leukemia. The scientists also plan to investigate the bubble-forming composites’ use in laser eye surgery, where the composites could associate with designated cells to allow low-intensity laser corrections.